The international team, including archaeologists from Bar-Ilan University, the University of Manitoba (St. Paul’s College), University of Saskatchewan (St. Thomas More College), Ariel University and Grand Valley State University published their findings today in the journal PLOS ONE. “This is significant because it demonstrates how early domestic donkeys were controlled, and adds substantially to our knowledge of the history of donkey (Equus asinus) domestication and evolution of riding and equestrian technology. It is also significant that it was discovered on the remains of an early domestic donkey that was sacrificed probably as an offering to protect what we interpret to be a merchant domestic residence uncovered during our excavations,” said Prof. Haskel Greenfield, of the University of Manitoba, the paper’s lead author. “The use of a bridle bit on a donkey during this period is surprising, since it was commonly assumed that donkeys were controlled with nose rings, as depicted in Mesopotamian art,” said Prof. Aren Maeir, from Bar-Ilan University’s Martin (Szusz) Department of Land of Israel Studies and Archaeology. Prof. Maeir has led the Tell es-Safi/Gath Archaeological Project since its inception more than 20 years ago. 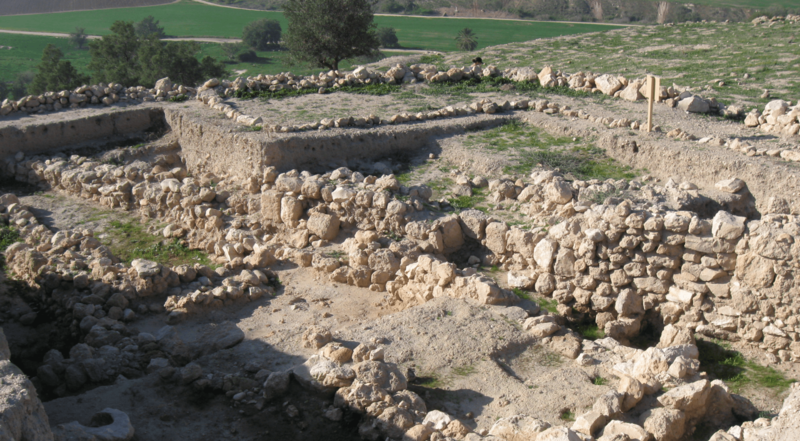 The excavations take place every summer in the Tel Zafit National Park, about halfway between Jerusalem and the coastal city of Ashkelon. The authors propose that the wear on the tooth of the donkey was made with a soft bit, likely made from rope or wood. “Only later, from the Middle Bronze Age and onward (after 2000 BCE), was it thought that bits, in particular metal bits, were used – first with horses that were introduced to the Near East at the time, and subsequently with other equids, such as donkeys,” added Maeir. Examples of these later bits were found in Israel at Tel Haror. The donkey is one of four that were found buried under neighborhood houses, which indicates the importance of the donkey in this society — most likely as a beast of burden used in trade, the researchers said. In a previously-published study the researchers provided evidence, based on isotopic analyses, that this very donkey was born in Egypt and brought to Canaan sometime during its lifetime. This demonstrates that this animal — and most likely others — was transported over large distances. Using bits allowed donkey herders to control the animals more easily during their transport.